The FNSS-PT Pindad Harimau (Kaplan) medium tank at IndoDefence 2018. The Indonesian Ministry of Defence (MOD) signed a contract with state-owned arms manufacturer PT Pindad to supply and deliver an initial batch of Harimau (Tiger) medium tanks for the Indonesian Army (TNI-AD). The contract, which was signed last 12 April 2019, is worth around US$135 million and would cover for the purchase of between 18 to 20 Harimau medium tanks, the quantity still dependent on the final equipment fit-out as specified by the TNI-AD. PT Pindad is required to deliver all tanks within 3 years’ time. 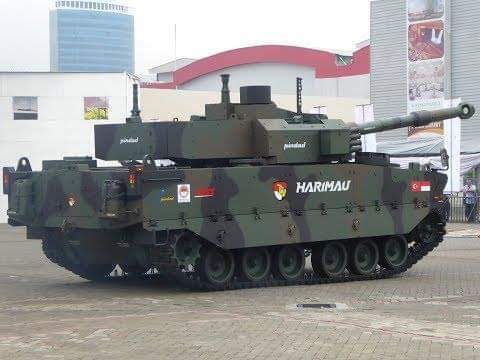 The Harimau is the result of cooperation between Indonesia’s PT Pindad and Turkey’s FNSS under the Modern Medium Weight Tank (MMWT) project and is called the Kaplan in Turkey. The platform is a newly developed tracked armored vehicle armed with a CMI Defence 150mm tank gun on a CMI-3105HP turret system. It uses an automatic loader system for 12 NATO-standard 105mm tank rounds, with another 30 rounds stored within the tank. Indonesia is looking at acquiring up to 400 tanks, and is eyeing export to friendly countries, with Bangladesh and the Philippines among the possible export markets.